A break seems to be just what Once Upon a Time needed. The first two episodes since the return have done a good job of building the tension. I said last week’s episode, “The Cricket Game,” was the best of the season, but this week’s show, “The Outsider,” beats it. While “The Cricket Game” had a few storytelling leaps of logic, this episode was tightly paced and entertaining throughout. It should be no surprise this episode revolved around Rumplestiltskin (Robert Carlyle). I have noted many times (if not in pretty much every review) that he is the most interesting character on the show. This week we saw his at his most despicable and his most sympathetic. I like that they keep the audience guessing with this character. One minute you think he is one of the cruelest individuals around and the next you feel sorry for him. And, of course, Carlyle does a great job of playing both sides. Rumplestiltskin (have we stopped calling him Mr. Gold? It was so much easier to type), has devised a potion that will allow him to step outside of Storybrooke without losing his memory. After testing it out on one of the townsfolk, he prepares to embark on his journey to find his missing son, Baelfire. I’m glad the show has shifted its focus to the missing son, since he was the catalyst for the curse in the first place (Regina might have thought it was revenge on Snow White, but it was really this all along). Baelfire was the only person Rumplestiltskin loved unconditionally, even more than he cares for Belle (Emilie de Ravin). That love is what keeps him from turning completely bad. On a side note, I couldn’t help but notice a subtle Star Wars motif in this episode. Belle continually saying that she knows there is still good in Rumplestiltskin was reminiscent of Luke to Darth Vader in Return of the Jedi. Henry was even dressed like Han Solo in this episode (white shirt with black vest). Hopefully that is as far as the Star Wars references go. As I said in an earlier review, just because they can (since Disney acquired the rights to the franchise when they bought Lucasfilm) doesn’t mean they should. Despite Rumplestiltskin’s considerable power, picking up and leaving didn’t prove to be as easy as he had hoped. Captain Hook (Colin O’Donoghue) was out for revenge. Hook threatened Belle, which brought on Rumplestiltskin’s full rage. Belle found out how Rumplestiltskin’s wife really died, but that didn’t dissuade her from her desire to make him see his good side. 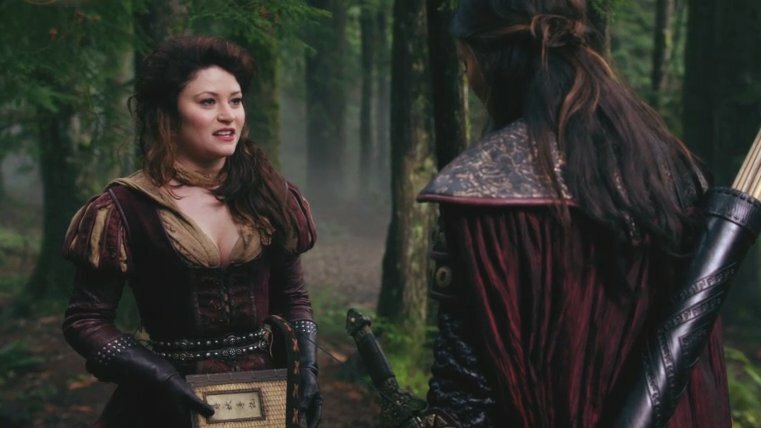 In flashbacks of Fairytale Land, we get to see a more courageous side of Belle as she works with Mulan (Jamie Chung) to defeat a ferocious beast. Belle begged Rumplestiltskin to not kill Hook, and therein a moral quandary developed. IF YOU HAVE NOT WATCHED THE EPISODE YOU DEFINITELY DON’T WANT TO READ THIS NEXT PART! The episode concludes with one of the best endings of the series. 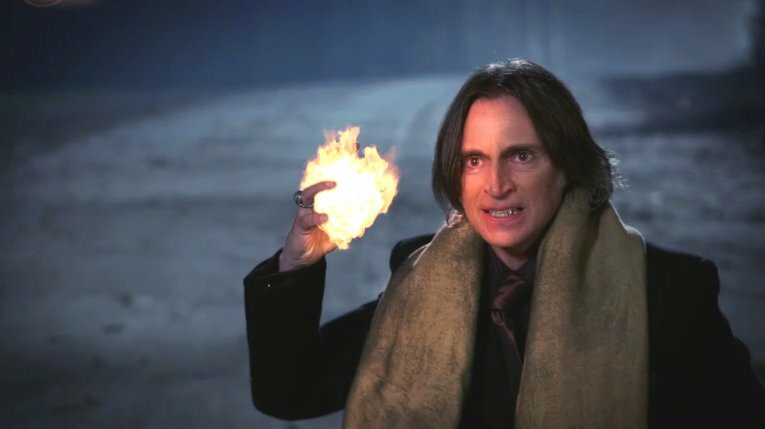 As Rumplestiltskin bid his goodbyes to Belle, as he was about to leave Storybrooke in his search, Captain Hook appears out of the darkness and shoots Belle. She is not killed, but she does fall over the line, forgetting who she is and more importantly who Rumplestiltskin is. Had she not insisted Hook’s life be spared, this would not have happened. So did she do the right thing? An enraged Rumplestiltskin is prepared to unleash is full fury on Hook when a car drives into town, hitting Hook and crashing off the side of the road. 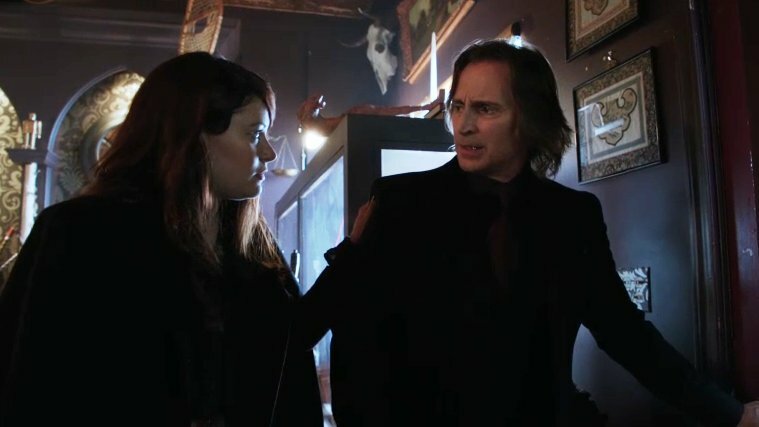 So we now have an incredibly angry Rumplestiltskin, an amnesiac Belle, and a new mysterious stranger in town. Rumplestiltskin said what was done couldn’t be undone. I have a feeling that won’t hold true, though I do hope they make it last at least a few episodes. The other characters were debating about whether they even wanted to stay in Storybrooke or return to the Enchanted Forest. Archie (Raphael Sbarge) was freed by Belle and returned to town to let Emma (Jennifer Morrison) and everyone else know he was still alive. We didn’t see any of Regina (Lana Parrilla) – except in the flashback sequence – or Cora, but given Archie’s reappearance, they are sure to be prominently featured soon. Here’s to hoping the show stays on track. Next week’s episode preview indicates that we will see more of the Frankenstein realm that was introduced earlier this season. I wasn’t crazy about that idea when it was introduced, but not that is has been established, I will keep my mind open that they can do something good with it. My guess the person who hit Hook in the car was the guy Emma was involved in during her flashbacks. A pigeon brought him a postcard ” The curse is broken” so it might be him. Where Pinocchio ?? His he still laying in a bed as a wooden puppet ?? Hi Lynnette! I think August/Pinocchio is okay now. I think he was the one who sent the post-card. I’m hoping to see more of him and Emma’s ex soon as well. I was wondering if the driver was the ex-boyfriend too. It didn’t look like him in the preview but there was only a quick glimpse and he may have looked different because of the injuries. Hi Sherry, When did the boyfriend get injured? As you can tell I’m totally hooked (no pun intended) on the show. I can’t wait till Emma and August reunite. I mean the injuries to the person driving that car at the end of the last episode – not sure if it’s the boyfriend or not. I’m looking forward to finding out. I just watched the Canadian tv spot of the next episode and it looks very interesting – there is a very strange moment in that preview to do with Rumplestiltskin.